Each bouquet is unique, made especially for you, using carefully selected vintage and new pieces which are time consuming to source. For this reason a deposit is taken and preferably a minimum of 4 months is required to make the bouquet. Personal consultation is carried out with the bride to create something unique and personal so please get in touch and arrange a chat! Price is variable depending on requirements but the average cost is £350 and a £100 non-refundable deposit is taken at the time of booking. 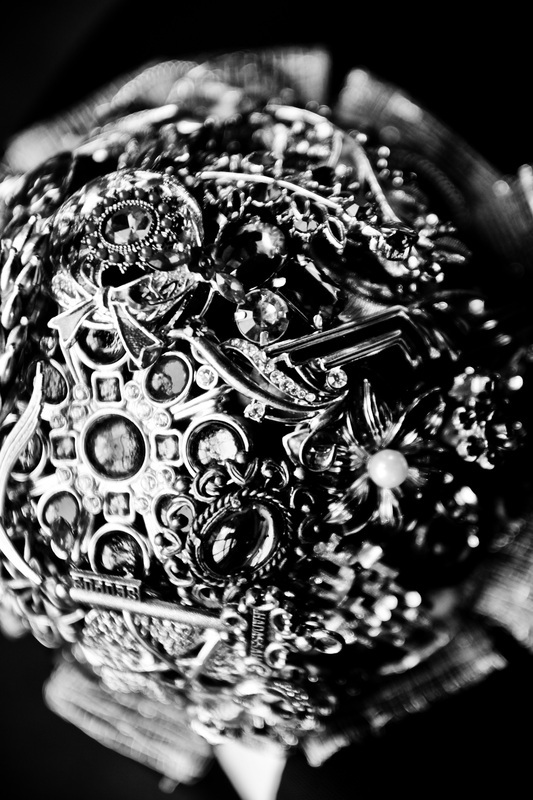 The majority of the cost involved in the bouquet is the raw materials, and I understand that many brides may have a large collection of their own or family jewellery they may want included. 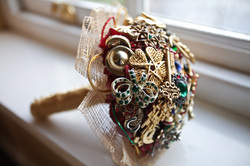 For this reason I offer an assemble service to create a bouquet from your own pieces. 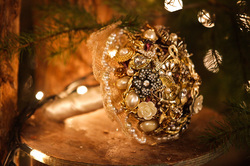 Many brides favour this option and the search for brooches can be great fun! 70 - 100 pieces are required for a complete bouquet. I recommend sticking within a colour scheme limited to 2 or 3 colours to get a truly cohesive look, a variety of size and one or 2 statement pieces are also recommended, perhaps take one special piece for inspiration and go from there. It's not just brooches, keep and eye out for large earrings and pedants too! and don't forget that it still takes several weeks to assemble, so please book your wedding date in with me at least 2 months in advance to make sure I can accomodate you. Although vintage pieces and colour themes are lovely, they take time! I can use modern pieces to create a bouquet in white stones, pearls and silver at short notice and with minimal consultation. It's not as personal but they are still stunning. In time I hope to keep a few of these in stock but otherwise should be able to turn one around with in a month. Available any colour and any size! Perfect for bridesmaids and flower girls! Please get in touch first to make sure I can accomodate your request! This deposit secures your order and covers the cost of the raw materials for the bouquet, if you are collecting your own brooches there is no need to pay a deposit!